Within a span of less than two months, Silchar, set its ball rolling for another international sporting event beginning Friday. If FIDE rating International Chess Tournament was not enough that concluded on October 3 this year, First India Cup Open International Taekwondo Championship began on Friday, wherein more than 400 participants would lock horns for the next three days. Teams not just from various states of India, namely, Assam, Meghalaya, Manipur, Arunachal Pradesh, Nagaland, Mizoram, Goa, Orissa, West Bengal, Tamil Nadu, Karnataka and Maharashtra would take part, but also, participants from Bhutan, Bangladesh, Nepal and Afghanistan, would also fight it out for the coveted prizes. The events, Kyorugi (full contact fighting) and Poomsae (non contact) of Taekwondo, a Korean martial art form, would be on display between age groups Under 5 to Under 60 in this ongoing championship. Organized by Cachar district Taekwondo association along with Kreeda Bharati Cachar district, this championship is being held in India Club Silchar’s Indoor stadium with a budget of Rs 22 lakh, informed, B C Nath, chairman, Organizing Committee. 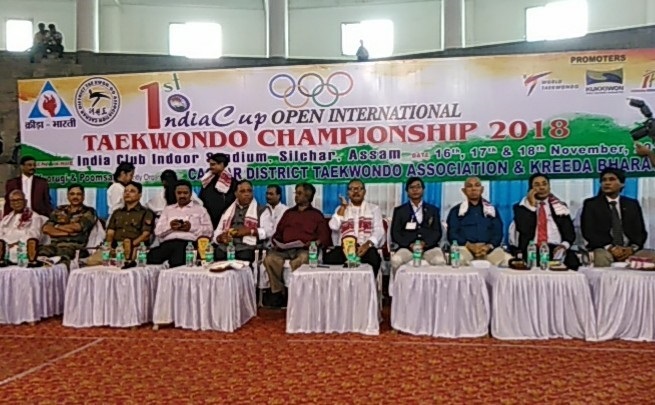 In presence of a host of dignitaries, which included among others, Silchar MLA and former Deputy Speaker of Assam, Dilip Kumar Paul, Minister of Assam for Environment, Forest, Excise and Fisheries, Parimal Suklabaidya, declared this 1st India Cup Open International Taekwondo Championship, open for the participants. Chief Minister of Assam, Sarbananda Sonowal, who donated a sum of rupees seven lakh for this tourney, could not be present personally, but, his address and message to the participants were read out on Friday amidst a glittering opening ceremony out here. A spectacular cultural programme representing dance forms not just from the confines of northeastern states, were presented, but, art forms like Bhangra of Punjab and Dandiyas of Gujarat, were also displayed during the opening ceremony. With the theme of ‘One India’ these dances were performed which caught the imagination of the spectators that were filled by school students of Silchar. “The bond that begins from such events has an everlasting effect and we want to do just that,” Parimal Suklabaidya said.